Raspberry seed oil is one of my favourite plant oils. Not only is it a really clever little worker for your skin, but it brings to mind gorgeous summer days and huge bowls of raspberries eaten outside with family and friends. I grow raspberries in my garden, and every time I look at their plump, perfect beauty I’m reminded of how good they are for you inside and out. 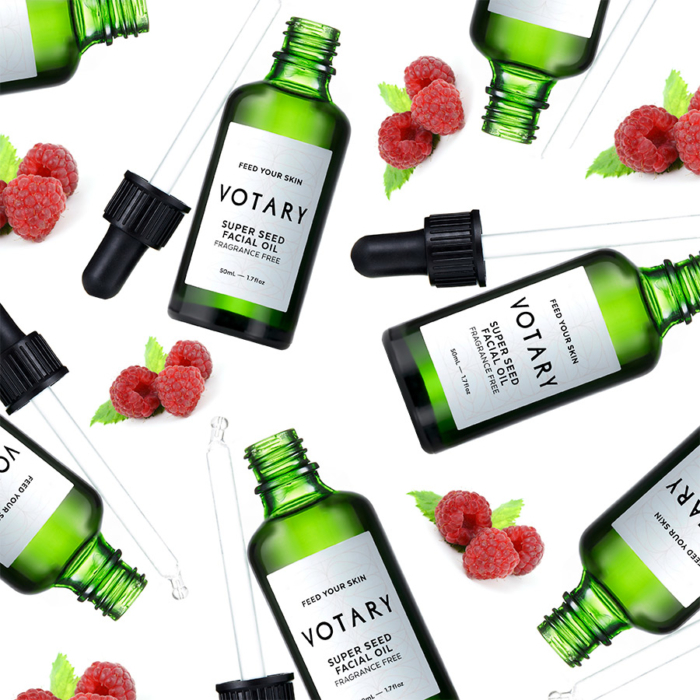 Votary pure plant facial oils are packed full of the potency of natural goodness. I’m passionate about feeding and nourishing your skin with the same natural, vegan, nutritious ingredients which are the building blocks of a plant-based, healthy diet. 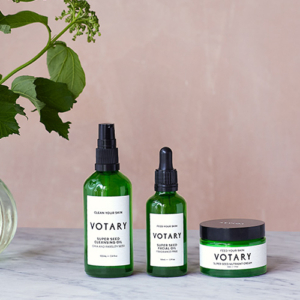 Votary skincare is like health food for your skin, nurturing it to beautifully calm, healthy strength. 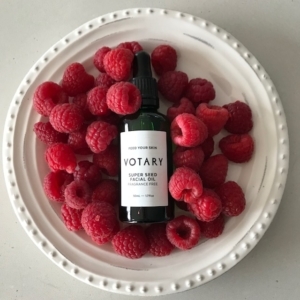 I was really keen for raspberry seed oil to be included in the twenty two different seed oils which make up our cult Super Seed formula because raspberry seed oil is full of nutrients that can make a real difference to the way your skin looks and feels. Vitamin E, which helps to minimise wrinkles, and tackles loss of elasticity and hyper-pigmentation. Antioxidants which help improve skin tone and elasticity. Omega 3 and 6, which are essential fatty acids and which help the skin’s natural barrier to function well. Omega oils work to carry moisture deep into the skin for long-lasting hydration. They reduce redness and condition and protect. They also help the skin to repair itself, and are super-soothing. As one of the superhero ingredients in our Super Seed range, raspberry seed oil is brilliant at nourishing your skin, and helps to make it resilient and strong. Our Super Seed range was formulated to re-set and restore sensitive, fragile skin, and to care for skin that is in hormonal flux such as during pregnancy or menopause. Packed with the nutritious purity of natural goodness, it can coax stressed skin back to supple health. Raspberry seed oil is one of the reasons it does it so well. Read more about raspberry oil here. Read more about our Super Seed range here. Watch nutritional therapist Frances Phillips talk about Super Seed here.